^ 2011 Mixed Martial Arts results (PDF). Boxing.NV.gov. [2011-04-07]. （原始内容 (PDF)存档于2012-03-20）. ^ Jones interview: ‘Guys Choice’ awards show appearance on tap as the champ deals with highs and lows of stardom. Sports.Yahoo.com. [2011-05-18]. ^ 3.0 3.1 3.2 Jon "Bones" Jones stats. Sherdog.com. [2011-04-07]. ^ 4.0 4.1 4.2 Jonny "Bones" Jones Bio. JonnyBones.tv. [2011-04-08]. （原始内容存档于2010-08-05）. ^ 5.0 5.1 5.2 5.3 Jon Jones stats. FightMagazine.com. [2011-04-07]. ^ Al-Shatti, Shaun. Morning Report: From Amateur to UFC in Three Months - A Jon Jones Video Timeline. MMAFighting. 20 April 2012 [28 January 2015]. ^ Guregian, Karen. Keeping up with the Joneses: Spending the afternoon with UFC champ Jon Jones…at Saks Fifth Avenue. BostonHerald.com. 2012-05-06 [2012-05-06]. 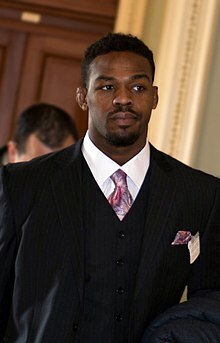 ^ Jon "Bones" Jones - Official UFC Fighter Profile. UFC.com. [2012-01-26]. ^ Gerbasi, Thomas. Official UFC 152 Weigh In Results | UFC &reg - News. Ufc.com. 2012-09-21 [2013-05-06]. ^ Fighter Scouting Report: Jon Jones. MMA Manifesto. [12 July 2015]. ^ @jonnybones. "It was an honor to receive a blue belt (...)". Instagram. July 23, 2017 [July 23, 2017]. ^ Keefer, Case. College career helped Jon Jones reach UFC pinnacle. VancouverSun.com. 2011-03-22 [2011-04-08]. ^ 13.0 13.1 Cobert, Gregg. Ravens DT Arthur Jones’ Brother "Ali-esque". BaltimoreSportsReport.com. 2011-03-20 [2011-04-08]. ^ Stevens, Kevin. UFC title 'means everything' to Endicott's Jon 'Bones' Jones. StarGazette.com. [2011-04-08]. （原始内容存档于2011-03-24）. ^ Tabuena, Anton. Is Jon Jones the Greatest of All Time? The UFC champ says he has 'toughest resume' in MMA history. Bloody Elbow. 4 January 2015 [28 April 2015]. ^ Snowden, Jonathan. Sorry Haters: UFC Champion Jon Jones Is the Greatest Fighter of All Time. Bleacher Report. 2 January 2015 [28 April 2015]. ^ Fight Matrix | UFC Records » Consecutive Wins. www.fightmatrix.com. [2017-01-19] （英语）.